March 7, 2015 March 16, 2015 ~ Trevis Dampier Sr.
A common legend of its creation takes place at the Convent of Santa Rosa in Puebla early in the colonial period. Upon hearing that the archbishop was going to visit, the convent nuns went into a panic because they were poor and had almost nothing to prepare. The nuns prayed and brought together the little bits of what they did have, including chili peppers, spices, day-old bread, nuts, and a little chocolate. They killed an old turkey, cooked it and put the sauce on top; the archbishop loved it. It’s Friday night and time to end the week with a bang! One of my favorite places to go for drinks and ridiculous tasty Spanish food is Cascal Restaurant in Mountain View, Ca. I am one of those foodie types where I need a variety of different foods throughout the week. Journeying to the same part of the world of food two to three times a week is not my style so I’m always experimenting and dining on something new. I’ve learned in the past that when you want Mexican food you should find a good hole in the wall restaurant to go get it because that is where the best tasting food will be. In California, Mexican is as close as we get to Latin food so getting some tacos or a burrito is a common thing but yet while I have heard of Mole and tasted it in the past it is not a common thing I see in menus. My fiance asked me to try out this place where she said they have great margaritas a couple years back so we went and since then this restaurant has been engraved in my soul. I make sure to come and visit anytime I have that Latin tingle shaking in my veins and my cravings are satisfied every time. The restaurants I venture to have a specific dish which usually bellows out to me. At Cascal that dish is the Beef Short Rib Adobo which is a Mexico City style braised beef short rib, with red onion-cilantro salad and fresh corn arepa and to wash that down a Rasberry Puree Caipirinhas which is the national cocktail of Brazil with premium Leblon cachaca (distilled juice of sugar canes), muddled fresh limes and sugar. 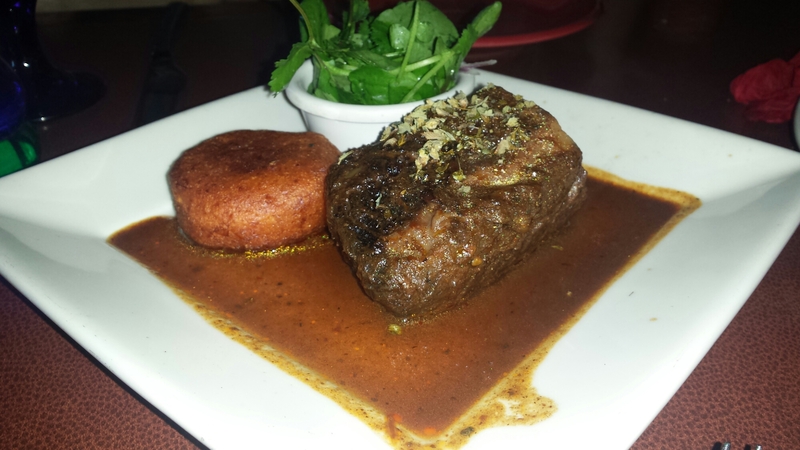 The Beef Short Rib can be cut with a fork since it is so tender and it melts in your mouth. It sits in a pool of divine mole sauce that you could drink with a straw. The red-onion cilantro salad combined with the short rib combined with this sweet cornbread on the plate is way out of bounds! Just ridiculous how good this is! Since I am writing the blog, I figured I would order a different dish other than ordering a double dish of the beef short rib so that way you guys would really get a sense of what Spanish food and this restaurant is all about. I looked at the menu and saw they have another mole dish. Tonight will be a Mole night! Let’s do it! 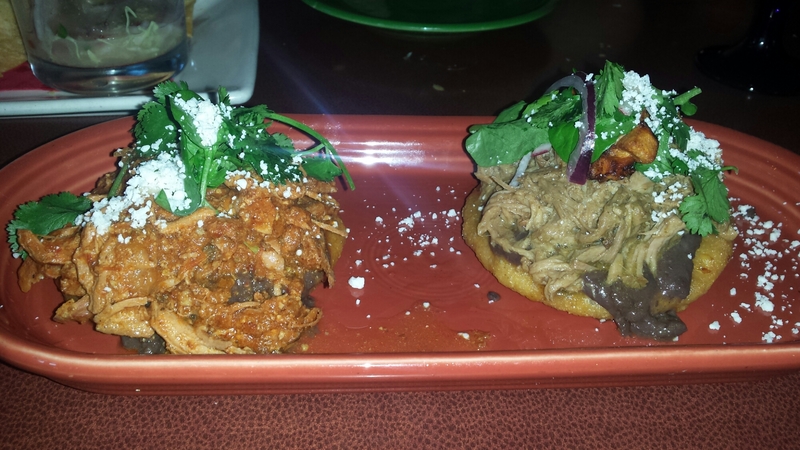 Tonight’s choice – Mexican Gorditas which is a Duo of chicken picadillo and Cuban roast pork, with a side of cilantro salad and mole Verde. This is a dish I have never experienced so I’m excited to see how this tastes. I look and see shredded pork and shredded chicken sitting on top of some type of breaded circular creation with a sauce in between and cilantro winking at me on top. I take the fork and dive right in this pool of delectable satisfaction. Yum! The chicken tastes as if it is had been cooked for hours. Melting in my mouth. The flavor of the shredded pork punches me in the face like Mike Tyson. Each item in this dish could stand like the Statue of Liberty by itself, but combined, this dish has a presence and taste like Mount Rushmore! Man that’s live action eating! I asked the waitress for hot salsa but she took too long so this mission ended quickly! Pooof..Like a magician it has disappeared. Nothing to it but to do it! If you have never experienced Spanish food, I HIGHLY RECOMMEND that you Google search and find one near you. This has been one of the best experiences of my life and I hope all of you have the same experience. I promise you that you WILL NOT regret it. Thanks for joining me on tonight’s adventure! Cheers! I’ll see you next time for some live action eating! Next > Oh this is grits……Dooooo Wop! Pleeeeease let me know…..If this ain’t love..